Invasive lobular cancer (ILC) responds poorly to neoadjuvant chemotherapy but appears to respond well to endocrine therapy. We examined the effectiveness of neoadjuvant letrozole in postmenopausal women (PMW) with estrogen receptor (ER)-rich ILC. PMW were considered for treatment with neoadjuvant letrozole if they had ER-rich, large operable, or locally advanced cancers, or were unfit for surgical therapy. Tumor volume was estimated at diagnosis and at 3 months using calipers (clinical), ultrasound, and mammography. At 3 months, if physically fit, women were assessed for surgery. 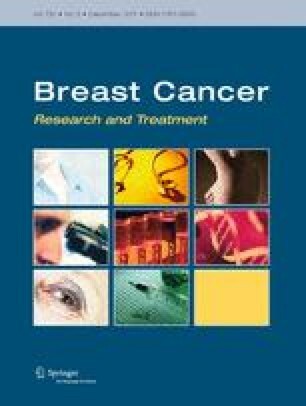 Responsive women with cancers too large for breast-conserving surgery continued with letrozole. Patients had surgery or were switched to alternative therapy if tumor volume was increasing. Sixty-one patients (mean age, 76.2 years) with 63 ILCs were treated with letrozole for ≥3 months. The mean reduction in tumor volume at 3 months was 66% (median, 76%) measured clinically, 61% (median, 73%) measured by ultrasound, and 54% (median, 60%) measured by mammography. Surgery was possible at 3 months in 24 cancers in 24 patients, and all but two of the remaining patients continued with letrozole therapy for a median duration of 9 months. At the time of this publication, 40 patients with a total of 41 cancers have undergone surgery. The rate of successful breast conservation was 81% (25/31). Twenty-one patients have continued with letrozole monotherapy, and 19 remain controlled on letrozole at a median of 2.8 years. There is a high rate of response to letrozole in PMW with ER-rich ILC. This study was supported by funding from Breakthrough Breast Cancer. Editorial assistance to finalize the article was provided by Novartis Pharmaceuticals. This is an original study and is not under consideration for publication elsewhere. The findings within were previously presented in abstract form at the 2009 San Antonio Breast Cancer Conference in San Antonio, TX. Medical editorial assistance to finalize the manuscript was funded by Novartis Pharmaceuticals; Maria Soushko, PhD, of Phase Five Communications Inc. provided this medical editorial assistance. All authors approved the final draft. The study is solely that of the authors and there has been no input from Novartis Pharmaceuticals in writing this paper. The authors declare no conflict of interest.